Direct from one of the world's premier cool climate wine producing regions, prepare your Angel lips for a palate full of crunchy pear flavours and lifted aromas of peach and nectarine. All this will leave you smiling through a crisp and lingering finish. Picked at optimum maturity in both the Wairau and Awatere Valleys, the Smalls have locked in a bright and luscious balance of flavour. They've crafted a style that avoids excessive sweetness or alcohol, showing of the fruit driven delights you know and love! 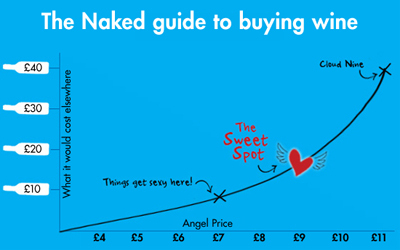 This is the first addition to Bill & Claudia's Naked portfolio since 2013, and at under $14 for Angels it will no doubt fly off the shelves! Pop a bottle or three in your basket today and see what all the fuss is about, you can't go wrong! Strap yourself in..this Pinto Gris is about to launch you to your happy place! Lychee and Nashi pear aromas will lift you up alongside floral hints…are you salivating yet? The vineyard is situated in the lower Wairau Valley in Marlborough NZ which is renowned for producing some of the world's most intense aromatic wines. You’ll be swept away with juicy fruit flavours and a subtle spice that lasts on the palate, balancing sugar and acidity that makes you want to come back for more. This wine was created on a foundation of quality fruit that was grown and harvested using organic principles. The vineyard has finished a three year organic accreditation process, continuously and strictly monitored for herbicide-free and pesticide-free practices. Growing organic fruit takes more labour and manual work in the vineyard, therefore organic grapes are always more expensive to grow. 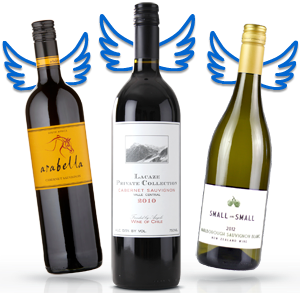 Angels don’t miss this unprecedented access to a brand new wine on the Naked Shelves…made in tiny batches, it will fly! This is the perfect White to pair with food ,or simple enjoy as an after work drink to finish a busy day. This wine was created on a foundation of quality fruit that was grown and harvested using organic principles. The vineyard is in the middle of a three year organic accreditation process, continuously and strictly monitored for herbicide-free and pesticide-free practices.